Barack Obama hasnt stopped emailing me. He always addresses me personally, he always tells me how important I am, he sends me links to videos, and always tells me what he is doing and what I can do to help him. Its been great, I have enjoyed being in such close contact with Barack (Im sure he wont mind me calling him Barack, its how he signs off on all his emails to me). So if Barack gets elected President in November, will he stay in touch? My gut is that he wont. Ok so he will be planning to run a pretty big country and Im sure thats a pretty busy job. But why would he stop? Why should he stop? If I voted (and I do vote but Im not American so I cant in this election) I would have been one of the reasons he got into the White House. So why does he need me less now than he did when he was on the road. Obama’s campaign was run on a grass roots level, it had a really personal feel to it. I even thought the ask for donations, as little as $5 was great, it made me feel like I can help, no matter what my financial situation is. I was a part of this movement of change. So it looks like he is going to win (although as he reminds me often, the job is not done yet, I still need to get out and vote). So why would he stop contacting me. I, as far as he is concerned, am one of the reasons he succeeded. Would I care less about what he is doing now….NO….I probably care more now than ever. I have emailed the Obama campaign to ask them about this, what their intention is once the election is over. I havent heard back…a worrying sign! Well I think as fundraisers we often communicate with people only when we need them, and then drop them. I think we spend so often asking that we don’t spend enough time talking, communicating, informing. People want to be a part of something successful, so talk about the successes. This all comes down to donor care. You need to care for your donors not just before and immediately after their donation but all the time. Because here’s the thing they care about your organisation. Don’t be like Barack (or how I suspect he will be if he gets to the white house). Don’t just talk to me when you need me and then ignore me when you don’t. The Institute of Fundraising and the Charity Finance Directors’ Group have joined forces with PricewaterhouseCoopers LLP to produce THE definitive piece of research on the impact of the current economic climate for fundraising organisations. It is intended that the survey will be completed by finance and fundraising departments to ensure a comprehensive and useful piece of research. Results of the analysis and a copy of the final report, will only be available to Institute members and members of the CFDG. Closing date for taking part in the survey, which will take about 15-20 mins to complete and will be analysed by PWC, is Nov 5th. 83% of people who say their financial situation has remained the same in the past year plan to give the same amount or more this holiday season. Amazingly 46% of those who said their financial situation had become substantially worse over the past 12 months still plan to donate online in November and December. 41% of those who plan to donate online said they intended to support groups such as food banks and homeless shelters. Slightly more than one third said they planned to give to religious organizations, and about the same proportion of donors plans to give to organizations that fight diseases. 24% plan to donate to animal-welfare organizations, and 22 % said they would give to support disaster and international relief groups. Households earning less than $35,000 per year were more likely than wealthier households to send online donations to social-service organizations: Nearly half of online givers at the lower income level said they would support those causes, while 38 percent of online donors in households making more than $100,000 annually said the same. The wealthier households that said they would give online were more likely to support health charities: 39% of those in the $100,000 and above range said they would donate to such groups, while just over a quarter of the $35,000 group said they would. Sixty-four percent of people with a household income of more than $100,000 plan to donate online. 9% of that group said they would increase their giving this holiday season. 46% of those who are 18 to 24 years old and half of those 25 to 34 plan to donate online, with 13% of the younger group planning to donate more this holiday season than last. More than half of people 55 to 64 plan to donate online this holiday, which researchers say proves that online commerce is not just for young people. 27% of online donors said that a charity’s Web site is the most helpful factor in deciding which organization to support. 15% said that an e-mail message from a family member or friend would make them more likely to donate online to a particular charity, and only 10% said that they would turn to a charity watchdog group to decide which organization to support. 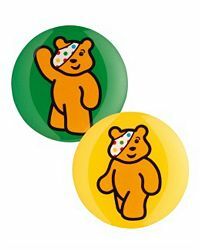 I was in Boots today and saw the new Pudsey Badges they are selling, they look good and are 2 for £1. No idea of it has anything to do with the economy, i.e. we should give more for the donation, I actually doubt it. But I wonder what the thinking behind it was. I bought one and honestly would have bought it if there was only one for a pound. Lately I have been asked by donors, nonprofit organizational leaders and board members to comment on the recession, how nonprofits should respond, and how to position their fundraising programs. First, let me tell you I took one economics course as an undergraduate student, and I’m not an economist. Just like millions of other Americans, I worry about what the recession will do to the good work that millions of nonprofit organizations do for their constituents. Second, we must face the reality that dramatic slowing or even negative GDP (gross domestic product) growth is a fact, and that further declines in production, retail sales, income and employment are upon us. The signs are becoming more and more evident that the U.S. economy did, in fact, enter its current downturn somewhere in late 2007. Dr. Ben Bernanke, Chairman of the Federal Reserve Board, has stated that the U.S. may be entering a period of weakness. That being said, the history of philanthropic giving in the United States supports the notion that our nonprofit sector has weathered every economic downturn since we began tracking how Americans give more than 50 years ago. A business and marketing expert recently offered the following advice to for-profit businesses seeking to learn how to deal with current economic conditions: “Consider the race car driver,” he said. “When you’re approaching a curve, give it more gas.” Sales experts tell us that tough times mean you should be looking for more leads to fill your sales pipeline. A recent report in The New York Times points to the potential of this year’s economic stimulus checks as an opportunity for some nonprofits. While national surveys suggest that only three to four percent of those receiving rebates plan to donate at least a part to charity, an average gift of $1,000 per taxpayer in that group would result in a $5.2 billion windfall for nonprofits, according to our Giving Institute colleague, Robert Sharpe, who has analyzed economic stimulus giving on the heels of IRA incentives in Congress’ Pension Protection Act. According to Sharpe, the key is for charities to recognize that, while 95 percent of the people getting rebates need them to pay for “necessaries,” the five percent who can afford to give away the proceeds from their stimulus checks means a lot of potential giving to the nonprofit sector. Click here to read NYT article. So, what strategies can you deploy to buttress your nonprofit and ride out the economic slump? How have you positioned your organization to weather this recession? First, consider your own “pipeline.” Put more emphasis on donor cultivation, donor communication and articulating your mission and purpose than on asking for the dollar. By focusing your energy and your message, you are getting ahead of the curve. Think about your competitors. Smart organizations look for partners to help them in an economic downturn. Share your story with other organizations that do similar work. Strengthen your program and message by forging collaborations. See if you both can’t become better organizations by outlasting the economic downturn. Don’t look back, look forward. Devise special messages for donors. Let them know what’s going on in your organization. Don’t be afraid to ask for special help. Now, don’t cry wolf if the wolf isn’t at the door. But for so many organizations, the wolf is at the door. Reach out and don’t be afraid to ask for what you need. Your best donors will respond. Don’t be timid. Those who are timid in tough times will lose. The public think charities spend far more on fundraising than they actually do, according to a new report. Research consultancy organisation nfpSynergy found people think 35 per cent of a charity’s income goes towards fundraising. The actual amount they spend is much lower, with the independent charity advisory website Intelligent Giving saying it is between 12 and 25 per cent. Joe Saxton, a spokesperson for nfpSynergy, said it makes sense for charities to spend more of donations on fundraising if it will increase their income for future years. “The survey should prompt charities to better explain the true level of, and the rationale for, all of their costs,” he added. On average people felt it was acceptable for a charity to spend 23 per cent of its income on fundraising.